The black Krome 61-Key Music Workstation by Korg features a wide selection of sounds, including piano, electric piano, dynamic drum kits, 640 programs and 288 combinations. The 61-key semi-weighted natural touch keyboard provides a feel and response ideal for any style of piano playing. Offering full-length, unlooped samples of every key for a spectacular piano sound, this new keyboard redefines your expectations for an instrument in this class. Taking its name from the Greek word meaning "colour," KROME is the new standard for sonic excellence in a gigging musician's keyboard, providing a limitless palette of sound to bring vivid inspiration your music. Introducing the KROME Music Workstation. Piano sounds are critically important for nearly every keyboard instrument. KROME borrows the impressive "German D Grand" that was created for the KRONOS flagship. Adjusting the mix balance between the direct sound (a mic placed near the head or cymbal) and the ambient sound (recorded from a distant mic to capture the resonance of the room), allows you to create a rich drum sound that has exactly the balance and character that you want. KROME's huge 800 x 480 pixel TouchView Colour display can show numerous parameters at once, ensuring great visibility. Simply touch the screen to change sounds or edit parameters. Finger-drag editing is also supported, allowing you to use the on-screen sliders and knobs directly. Numerous functions take advantage of the TouchView interface, such as the piano roll editor, a stopwatch thats convenient for keeping track of a live performance, and a calculator keypad that is convenient for entering numerical values. Krome connects to your computer via USB to easily transfer MIDI data. An SD card slot is also available to help you manage Krome's data files. The Krome Editor and Krome Plug-In Editor allow you to edit your Krome settings from a computer and/or integrate it as a software synthesizer in your DAW. 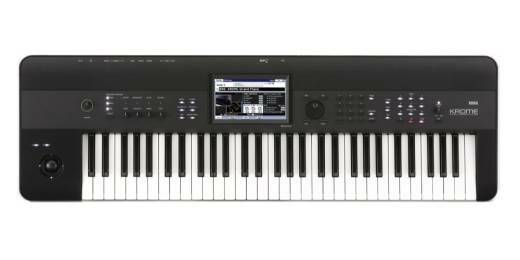 Master Keyboard Functionality: Krome can act as a Master Keyboard able to control external MIDI devices such as sound modules. Combination, Sequencer Mode: 2 units are available. I like everything about the Krome 61 except the sounds. The keyboard feels good, and I love being able to tailor the sounds so extensively. However, most of the sounds are boring to useless. The acoustic piano is lousy, as are the electric pianos. Many of the sounds have easily detectable sampling flaws on some keys. It appears no one at Korg with ears ever tested it. This is a great instrument. It is great quality and sounds amazing. Korg is always great. this board (krome 61) is well overpriced for what it is, the pianos are pathectic and the organs are even worse, there are PLENTY of stores in Canada doing this korg lots cheaper even some with free extras. the best I can rate is only 1 star.